WASHINGTON — The U.S. Federal Communications Commission on Dec. 5 okayed the first part of a satellite-servicing mission Orbital ATK’s Space Logistic subsidiary has with Intelsat, saying the servicing vehicle can execute “rendezvous, proximity operations, and docking with the Intelsat-901” satellite while in a graveyard orbit. Regulatory approvals for the first Mission Extension Vehicle-1 (MEV-1) are proceeding as planned, Joe Anderson, vice president of business development and operations for Space Logistics, told SpaceNews Dec. 12, though the FCC deferred on some of the company’s requests. The commission has, for now, withheld permission on a request from Space Logistics LLC, the subsidiary handling Orbital ATK’s satellite-servicing business, for relocating Intelsat-901 alongside another Intelsat satellite. The agency also deferred on a request to undock MEV-1 from Intelsat-901 at the end of that mission and to return MEV-1 to a graveyard orbit to await its next assignment. Anderson said Space Logistics wasn’t surprised the FCC withheld some permissions because Intelsat hasn’t said where exactly it intends to place Intelsat-901. Space Logistics has a contract with fleet operator Intelsat of Washington and Luxembourg to provide in-orbit servicing with MEV-1 — the first in a proposed fleet of satellite servicers Dulles, Virginia-based Orbital ATK intends to build — with service beginning in early 2019. Space Logistics’ MEVs works by connecting to a satellite and taking over station-keeping, using fuel onboard the servicer to propel the satellite and extend its life. Most geostationary satellites are forced into retirement after 15 years or more due to a shortage of fuel. “It is in our plan for Intelsat-901 that at the end of the five-year life extension mission that we would return the IS-901 to the graveyard orbit and release them there. After that release the MEV would then proceed onto our next client,” Anderson said, adding that the next client has not yet been identified. Satellite servicing is a relatively new area for regulators, consequently requiring a lot of trailblazing by Orbital ATK. Anderson said the company has been in a dialogue with the FCC, the U.S. State Department and the Federal Aviation Administration (FAA) for several years, and those discussions concluded that the FCC would be the licensing body for launch, deployment, docking and TT&C. Space Logistics needs two licenses, Anderson said — one from the FCC, and another from the National Oceanographic and Atmospheric Administration (NOAA), an agency Orbital ATK has also been discussing satellite servicing with for several years. The NOAA license is required because the MEV has cameras for docking that could also image the Earth, thus necessitating a remote-sensing license. Anderson said the NOAA license is also proceeding well, and should be complete in the first half of 2018, barring unexpected questions. International Launch Services is under contract to launch MEV-1 in late 2018 on a Russian Proton rocket as part of a dual launch with the telecom satellite Eutelsat 5 West B. Orbital ATK is building both MEV-1 and the Eutelsat satellite. In September, Orbital ATK said MEV-1, having completed a critical design review earlier in the year, was in production with roughly 75 percent of the platform and payload components already at the company’s Virginia factory. Once launched, MEV-1 will rely mainly on electric propulsion for two to three months of orbit raising, during which the vehicle will undergo in-orbit testing, Anderson said. After testing the MEV, he said Space Logistics will conduct two to four weeks of testing with Intelsat-901 and MEV-1 in the graveyard orbit before beginning life extension services. MEV-1 uses electric propulsion for station keeping and relocations, and a chemical propulsion system for rendezvous and docking, he said. Intelsat-901 launched in June 2001 on an Ariane 4 rocket, carrying C-band capacity over the Americas, Europe, Africa and the Middle East, and additional Ku-band over the Caribbean and Gulf of Mexico. The satellite is now more than 16 years old. In September, Intelsat launched a replacement satellite, the more powerful high-throughput Intelsat-37e Epic satellite, and said Intelsat-901 would be repositioned. 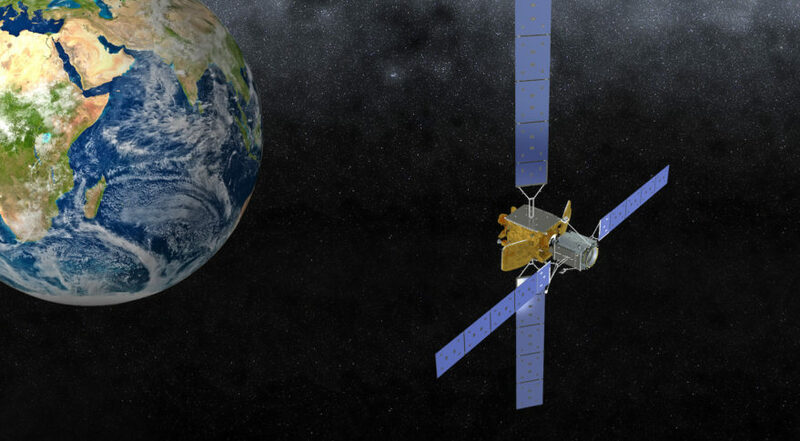 Intelsat, in a quarterly commentary document released in July, said it plans to use MEVs “to extend the operational life of two of our wide-beam satellites.” The satellite operator now factors MEV use into long-term fleet planning. CEO Stephen Spengler told SpaceNews in September that satellite life extension gives the company greater flexibility in planning future spacecraft. Intelsat spokesperson Dianne Vanbeber on Dec. 12 acknowledged plans for a second MEV mission, but declined to give specifics, such as whether that involves splitting up the five-year Intelsat-901 mission, employing MEV-1 on a consecutive mission, or using a new MEV. Space Logistics’ first MEV has a design life of 15 years, enabling multiple missions before its own end of life. Orbital ATK plans to upgrade MEVs over time to include greater robotic servicing capabilities.